The finest blue known to the ancients, was obtained from the precious stone lapis lazuli (lazurite), a costly mineral. The mineral lazurite is a complex sodium calcium aluminum silicate sulfate. 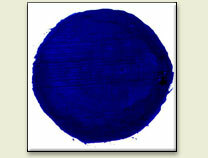 Ultramarine blue is a historical pigment having been found in Egyptian tomb paintings. Raphael, Leonardo da Vinci and Michelangelo Buonarotti used the pigment. Synthetic ultramarine was produced at the beginnig of the nineteenth Century. Word origin: The name "Ultramarine" comes from Latin ultra = beyond and mare = sea. This painting was painted during the restless period in Renoir's work. It is immediately apparent that the picture exhibits two distinct styles. The group of figures on the right is painted in a soft feathery style reminiscent of his work of the later 1870s, while the umbrellas and the couple on the left are painted in a harder manner with more distinct outlines and subdued steely colors. The exact date of the painting is not known, but it is generally accepted that it was worked on over a period of several years. Notice how the fashions illustrated in the Umbrellas differs. The women in Renoir's paintings are usually dressed in the latest styles. The dresses and hats worn by the figures at the right conform to a fashion that appeared in 1881 and which became popular in 1882. The vogue was superseded the following year by a more sever style of dress with simple straight lines. THe woman with the band-box is dressed in this latter style which was the height of fashion in 1885-6, but which had fallen out of favor by 1887. Renoir appears to have changed his palette significantly between the two stages. Examination of the cross-sections has shown that in the earlier phase he used exclusively cobalt blue, his habitual choice during the 1870's and early 1880's, but in finishing and revising the composition he used only artificial ultramarine.